Prior to 1996, the only Suzuki-branded autos you could buy in the U.S. were the Samurai, the Swift, and the Sidekick. That was fine, except Suzuki was missing a vehicle that was a bit more mainstream for the American market. Something a bit more passenger friendly. So, Suzuki added the Esteem. 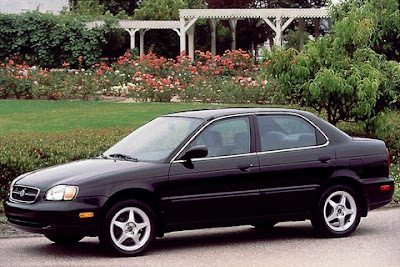 The 1996 Esteem was available as a four-door sedan with a 98 horsepower SOHC 1.6-liter engine mated to either a five-speed manual or a four-speed automatic. Curb weight was low at a minimum of 2,183 lbs., and fuel economy was rated at 31/37 (now revised to 26/34). There were two trim levels: The GL and GLX, with the GLX receiving standard air conditioning and power windows/locks, among other things. Both versions offered standard dual airbags, and the GLX was available with ABS. 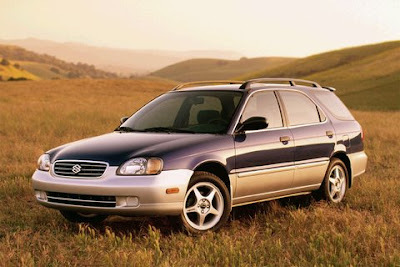 In 1998, Suzuki introduced a wagon version of the Esteem, which could swallow up to 100 lbs. of additional stuff. The rear seats folded down to allow bigger loads, too. The biggest change came in 2000, when the Esteem Sport was introduced. This version came with a new 122 horsepower, DOHC 1.8-liter engine; fog lamps, and a rear spoiler. It also was available with attractive Speedline five-spoke alloy wheels. Overall, the Esteem flew under the radar for most of its life. It wasn't critically acclaimed, it didn't have much of an enthusiast base, and it didn't standout among its competitors. Nowadays, a used Esteem can be had for very little money, thanks to a fairly poor resale value. From my research, it appears that the Esteem is a reliable, frugal mode of transportation, though, and many owners will tell you they were trouble-free vehicles. I can't help but be intrigued by the prospect of an Esteem project vehicle, though. There is a limited aftermarket for the Esteem, although Suzuki Baleno parts (aka the Esteem in Europe and other parts of the world) can be imported. Below is a video of some European Balenos, including the hatchback version the U.S. didn't get. One of the better places to find Esteem info is at Suzuki-Forums.com. I remember that locally at least the Esteem wagon was a pretty good seller; for a while it was the only Japanese wagon in the US except the Impreza. I still see plenty more wagons than sedans. The sedans were rarer, almost all the ones I saw new were in Thrifty Rent-A-Car's fleet.